I think I want 6 next. @Jeremy & Reo; these are really awesome guys! I'd like to claim tile 67 if possible. Edit: Here's a WIP I'm working on, any critique is welcome and appreciated. I've been in a rut so anything to improve form is welcome. Also the beast/dino doesn't seem isometric, if you'd like some help with how to make it iso, please let me know. 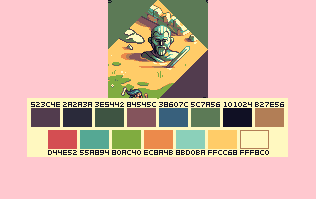 Whoa, these are great, love the use of palette! Since Tile #71 that you have selected is adjacent to my already finished Tile #64, Night, I just cannot wait to see what amazing things you can do with your chosen tile using your own absolutely phenomenal 15-color palette called Equpix15. 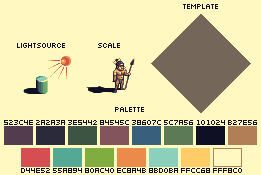 And you know something, that very palette right there is quite one of the rather truly best that I have ever, ever had the grand pleasure of using as part of this most excellent 2018 PixelJoint ISO collab project that I am so glad that you are a part of!!! Ok, i done the tile. Edit: Maybe is not ready, any feedback for this. Not finished yet, but getting somewhere, I suppose. So, what is the word on my Tile #50 in terms of the overall quality and how well it pertains to the overall theme? Do share with me your thoughts on that and more, please. Thanks again so very much once more, and with many more and more new tiles that are currently hard at work, I am TREMENDOUSLY quite ecstatic to see where this grandly important project takes us as we explore even newer and much uncharted, far greater heights of masterful creativity quite indeed. An absolute pleasure working with you all once more, most definitely!!! @Minord, the tile seems great overall but you have a few wrong colors, also some places such as the ivory, the spear etc can use a little antialiasing. (I'll put it on the image regardless but please at least fix the colors). Important note: I moved you to #37. @Silenia, the tile is great but all your colors are wrong. @Adigun; the geyser/volcano doesn't really blend with the ground, thus seems like an artificial item. Unless that was your intention you might want to look into it. Otherwise it's a great tile. Almost there with 34, gonna finish this evening. @Minord: I like the tile and the way it comes of as a science illustration. I do think the scale is slightly off and your guys are about a head too high. I also don't think they're in perspective. You should map them out as ISO-skeletons and put each character on a grid before starting rendering, even the ones offscreen like the mammoth. super quick scribble over. The dude with the sword is most affected. The mammoth's trunk also blends in with the bottom-most guy's head. Otherwise I think the core of the tile is nice and illustrative, just needs a bit of polish. Always nice to see more isometric mammoths! Also very early WIP, starting a lil village. Extremely rough WIP for #22. I'll try to finish it by tomorrow. Could I request a random tile? I'm really excited to try this, but I am fairly new and have almost no experience making isometric pixel art. Does anyone have any advice on how to go about doing this? As you see the base of the house goes left and right in 2:1 direction (2 px right 1 px up). Check out an organic shape drawn in isometric perspective. Basicly whatever you do, draw an isometric skeleton and build over that. I'll answer anymore questions you may have. Are these changes good enough to warrant this tile fully completed, or do I need to keep practicing on it until I do get it? I do want to be clear on making sure the tar volcano’s color balance fits as clearly with the ground as possible so that it blends in richly, without it being too dark or too light. I want it to be just right... which was why I want to check with you to make sure it is indeed with the latest update to Tile #50 indeed, which I have *just* implemented in entirety live at the time of me writing this very post, of course. Now you know why tar pits and tar volcanoes both are rather iconic facets of prehistoric times on their own, in their own right. And should be. As for your current tile which is #34 that you just now finished, Gecimen, it is just absolute first-rate stuff, and I truly love it, as it would quite easily make another outstanding to our current 2018 ISO collab map. Fantastic job all the way so far; really proud of you!!! And as for your input that I have so far on my Tile #50, it has been quite rather helpful and supportive, and I especially thank you from the bottom of my heart again for that and more!!! Really appreciate that, man!! On your tile, i believe what he meant was that the geyser has nothing that connects it to the ground, and thus seems like a solid object placed on top of the ground, instead of being part of it. In another sense, the geyser is just floating above the ground, and isn't connected to it. I did a rough edit to show an example. That aside, I'd like to do a reference from the game Chrono Trigger, but I'm iffy how well it fits the theme.. As such, if anyone thinks it's out of theme, i'm willing to do a different idea. And with that, I just want to be sure I finally got it done right. What do you think of the changes now; have I done a much better job in the fixes on here? Thank you so much once again for your latest input, CuriousBeefJerky. Duly noted, indeed. The 3rd version is much better in terms of blending. Good work! Also Reo and Curious thanks for the feedback you give to other participants! Gecimen: hm, I used the template image with palette to grab the colours though...just checked, but seems that either there's some weird shenanigans going on when I copy the template image or the colours in the template image are off too. I'll fix mine in a couple of hours, don't have the time right now. Gecimen, thank you quite especially. My pleasure and quite a surefire honor, really, as it was rather amazing for me to be a very special part of our ever-important 2018 PixelJoint ISO collab project, just like all of our other participants as well... such a great and most splendid new week to you indeed!!! !! Thank you, that is very helpful. I am going to experiment a bit with this style before reserving a tile I think. Well apart from the perfect rendering, I feel this tile begins to give the collab the thematicness it needed. Wonderful work! Update to 58. Something feels off with this tile, so i'm gonna give it some time and look over it then. Any critique or advice on it is welcome. Not bad at all. the left character needs some contrast to be better readable, like some black outline on the darker parts (pants and shoes). The right character's beard is not very readable atm. But apart from these it looks ok.
Hey is it fine if I switch 15 out for 26? The idea fit much better with the tiles over there? And thanks a lot Geci, your tile is beautiful too! Okay, can I participate and take number 5? @zedOFF; of course you can! #5 is yours. Enjoy! Oh absolutely, I'd like any critique on it, I'm not too familiar with attempting Isometric work. EDIT: I have no reason why the quotes are messing up. done for now unless someone has any criticism. Edit: a little something to continue to next tiles (Please take this only as an inspiration - you can do whatever you want with your tile and do not have to continue the idea). Thank you for the advice. On the mustache guy, I see I messed up bad cause he's supposed to be a robot lol. They're a group of time travelers, which is why I was iffy about it fitting the theme, but they do travel to 10,000,000 BC. I mostly redid the robot, and added contrast. Any further advice is welcome, as something still bugs me about it.. Maybe the mushrooms.. Thank you again though! I am so glad you have completed Tile #72, Gecimen, and you have sure picked an EXCELLENT time to claim that piece all to yourself because the most lovely adobe-created house that the armed tribesman closely guards (and most proudly watches over with such thorough eagle-like eyes, also!) is just splendidly plain wonderful to look at at all times — especially in the way you most superbly created the intricate little details (like the steps, the windows, the ladders, the clay-fired vase, the shadows, and the overall way you magnificently colored and positioned that entire home to begin with using such amazingly outstanding pixel-work that you did on this whole tile piece of yours throughout, too, including your character as well here!!! ) that all made it so truly damn good in the first place. I absolutely love this piece indeed, as it would make a rather plain awesome addition to our 2018 ISO collab map in its successful entirety, if I quite do say so myself!!! Truly BRILLIANT work overall, my great man; congratulations to you on that!!! !! WIP for 26, going for a pagan sacrifice. But it's gonna be a few days before I can finish it up. @Adigun, I’m honored to hear you observed it so carefully! Thanks formuour kind words. Having just said all of that now, Gecimen, our current new ISO collab map is already looking more and more absolutely quite wonderful indeed with each passing day so far... CHEERS!!! !! Thanks for the feedback, i try to implement some of yours points, but my implementation is not soo good in this case. anyway, i'll try to take in acount the next time. This is the result. i can take another tile, 81 maybe. Thanks for the feedback, i try to implement some of yours points, but my implementation is not soo good in this case. I think your image is suffering from a lot of noise. Because of this, it's very hard to make out what's happening in the scene. you have reason i will try to solve it, thanks for the observation. @Minord 81 is reserved, can you please check the reservation list for another? I really wasn't sure if I was going to be able to do something worth adding here. So I didn't reserve the tile I was working on. I'd like tile 57 if it's still unspoken for though. It looks great, I could even put it in as it is, but I must say it lacks something interesting. It's up to you really - you could call it done or add something (even something small such as a reptile, a bird or something flying).